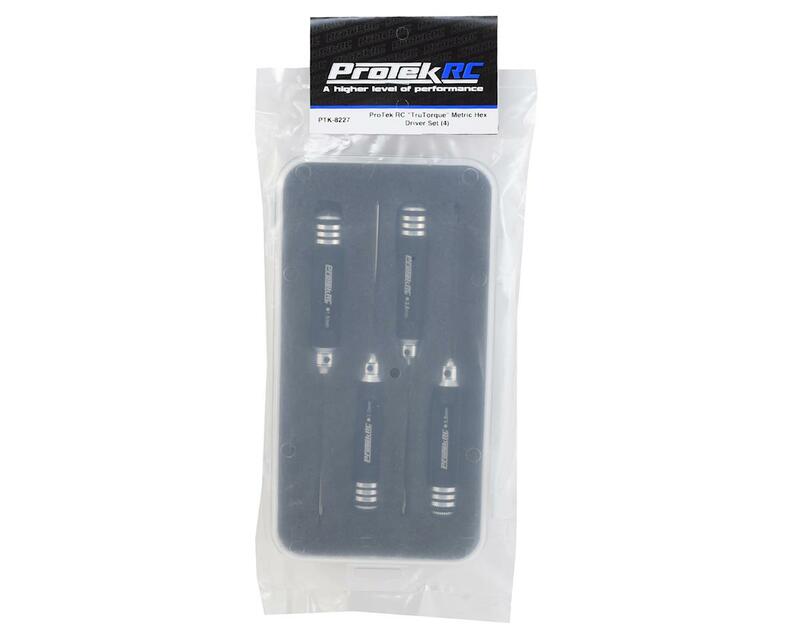 This is the ProTek R/C "TruTorque" Metric Hex Driver Set. No one wants to spend money on low quality tools. Tools are an investment that should not be taken lightly and are one of the few items that should outlast the life of the model you are working on...and remain with you for years after. With so many choices available, the decision can be overwhelming. So ProTek R/C has stepped up again, expanding its product line with a complete range of affordable, high quality tools that help to make the decision a little easier. ProTek R/C "TruTorque" hex drivers feature lightweight machined aluminum handles that have been knurled to provide a high leverage, non slip surface that will be comfortable to use during long wrenching sessions. The tool size is etched into the handle for easy identification and a black rubber cap is fitted to the end to increase comfort during use. The precision cut tool steel tips provide an exceptional fit with the fastener, and feature a bronze colored finish that not only looks good, but also helps to protect the steel from corrosion. Finally, the tool sets include a snap lock case and foam insert that will store your tools safely and securely when not in use. I typically run dedicated tools in my bag, and then tools that stay on my workbench. I use the tougher and more portable options for my hauler bag and use/abuse at the track. My race bag tools are MIP mostly. I picked up a set of these Protek wrenches to reside on my workbench and simply be handy. I honestly was not expecting much, but they have successfully impressed me. They feel good in your hand and the tips are very solid, I have not had any rounding or breakage and I have built 3 kits from the ground up with them now, and all the typical workbench maintenance. The only slight criticism I have is that they all look exactly the same other than the tiny size etching on the side of the handle. I have the metric and SAE set, so this makes it much harder to know what size you are fumbling for at a glance. It would have been nice to add different color caps or have the option to buy colored caps. I am sure if I dig around enough I will find colored caps that work from another brand, I just wish I didn't have to dig around to find it. Other than that minor criticism, these wrenches are excellent! The handles feel good and the tips are nice. The replaceable tips are a nice addition and I haven't had them come loose on me yet! Great set of drivers, need to locktite the set screws in them but not a big deal. Very comfortable handles and the tips are strong. Not quite as stout as my MIP but the handles are so much more comfortable and they have replaceable tips so it evens out. Definitely recommend. I have been using these for over a year now!!! I am very happy with this tool set. I like the weight balance of these hex drivers quite allot. I feel like allot of hex drivers feel like toys, this set has a good solid feel without being too heavy or too light. The tips have held up well especially considering I use them every week. I highly recommend this tool set! Top notch quality, very durable and stylish as well! Excellent tools. Nice strong tips help hold screws and prevent stripping. 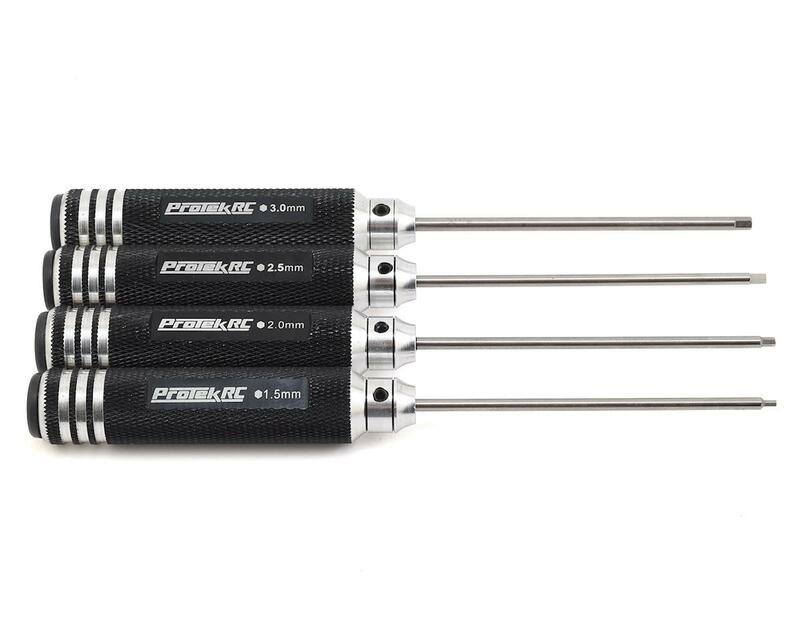 great set of hex drivers, tight tolerance and feel great in your hand. You get quality with this set. Work great. The caps fall out but not an issue for me. Had to tighten set screw on the 2.0 after my second kit build. So far 3 kits and race days for 2 months with no issues. Great set, well built. The machine work on the tips is right on. Great knurling on the handles. Tips are great quality. I wish there were different color plugs for the handles. I've built two kits with this set so far and no problems. I felt a shaft a little loose once and I instantly removed the set screw and applied threadlock, no big deal. You can tell if they get loose. Unfortunately I have to disagree with all. I have had this set for a while and the grub screws that hold the shaft of the driver bits come loose and when you tighten them they strip and no longer hold, making them useless. I love "A Main" but these are poorly made. I have Arrowmax drivers that are much better. Maybe I just got a bad batch! The tool sets from Protek RC are phenomenal! Not only is the quality amazing, they look good in your tool box. I have had numerous racers ask me about them.